After taking a blog break, I’m back! So much has happened! Recovering from my most recent half marathon that I ran three weeks ago (Bear Creak) started out ok. I headed out the Monday afterward and felt a tight pull in my left side. I headed to the Chiropractor and found it was most likely linked to a VERY tight hamstring. So, I decided to take the following day off and any running I would do would have to be reduced to a light, gentle jog (as per my Chiropractor). I spent my mornings in quite time with the Lord, then did my jogs and headed home to care for little guy so my mom could go to work…. home all day. Meanwhile, my God Grammy was in the hospital and without a vehicle or bus/bart money, I was unable to see her. As Friday approached, my body began to feel a little off again. I decided to wait it out and see how I felt over the weekend. That Sunday eve, a traumatic event occurred that lead to mom and I taking a loved one to the ER. I ended up leaving my mom and the loved one so they could be transported to another hospital. 2 am, my body in pain again .. I drove my mom’s car (still running in the rough side) home. I woke early the next morning, called and tried to contact my mom to find she was asleep, and decided to try go for a jog. A few laps around my little parking lot loop and… a sharp tug! I headed up the hill, on verge of tears, tried to jog… TUG again!!! This time, more sharp. I could barely walk to my door properly. Immediately, I called to find out if my mom was awake. Once in contact with her, she gave me the ok to go to the Chiropractor but was to go strait to the hospital afterward being that we only had a small amount of gas and next to no money to buy more. At the Chiropractor’s office, as he was adjusting me, he said my body was in worse shape than he’d ever seen it… I broke… how was this possible? I was SO careful! The only lifting I’d done was putting little guy in his high chair and crib and giving him hugs! I was jogging lightly and stretching as instructed… then pressures from everything (God Grammy in the hospital, mom’s car acting up, being at home all day with a child I adore yet have had to constantly teach to be nice, dealing with his tantrums and biting; our lack of income, my lack of health insurance while waiting for medi-cal to go through, ect) set in and I tried to hold back tears, but they began to pour… my poor chiropractor spoke up, “what? Is it your back?” “No, it’s everything… I just want my life back! I want to be able to pick up my loved one without being afraid my back’s gonna fall apart; run, race, walk, sit, stand, lay down without pain; go to the store and be able to buy things without stress… I want my life back…” and the tears poured harder. “Well, I’m sorry, I can’t help you with that.” He said apologetically. “I’m sorry, I didn’t want to say anything. You’ve already done waaaay to much. I can’t thank you enough.” I thanked him and his staff and headed out of the office and off to the hospital. There, I gave my mom a care package from home and spent the eve. The following day, my loved one was released and mom and I were headed home to face more trials. No money for food or gas, we spent the rest of the week trying to make what we had last. Meanwhile, I was to refrain from training until the weekend, so I opted to do some walking (as per my Chiropractor) back and forth inside my apartment to keep my muscles from stiffening. On Thursday, somehow I ended up in pain so severe I was in bed in tears the majority of the day. I txt my two mentors, and asked them to pray for me in the battle I’d been fighting. I prayed and cried out. While texting one of my mentors I got really emotional… I wanted so badly to drive myself into a positive forward motion, but how? I felt like such an idiot for driving so hard and training for these events to be left laying in bed in pain, with nothing to show for all the strife. 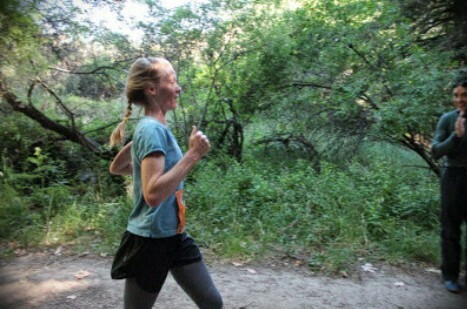 The dreams of running in the Olympics (yes… still a desire of mine) and running more ultramarathons to display the power of God through a transformed life and sharing my testimony in hopes of encouraging those lost and on a destructive path to change for the better seemed to be crumbling before my very eyes! My mind was racing… I could go back to school and become a nurse, but how? This is something I’d wanted to do for a while.. however, So many road blocks… The pain along with the raging seas around me… uhhh. Thankfully, the following day the pain subsided. I did a light jog back and forth in my apartment (yes, in my apartment, on the floor of my home) then spent the rest of the day feeling much better! Yet still feeling overwhelmed by my circumstances. I tried so hard to give them to the Lord, yet the heaviness remained. Saturday rolled around with an opportunity to visit God Grammy and thankfully, a good friend of mine was kind enough to take me out to see her and my God Mom. We hung out, outside the care center then went inside to finish our visit. After a quick break with my God Mom to run an errand, we returned and I went up to her and said… “hey! It’s Jamie!” The smile on her face was so big… my heart melted and wept at the same time. Such a bittersweet moment.The following day… another blessed opportunity to see her! So, I had a “mini church service” w my God family, ate lunch outside in the sun, and… my God Mom took me home. Both visits, the emotions were high .. I tried to contain them as best as I could. From seeing God Grammy the way she was to the battle at home and with my body… I felt like I’d cried out to God and spoken to each mountain time and time again only to get totally smacked down! Monday came and went. I came in contact with my cousin only to find my grandmother (my dad’s mother who I haven’t been able to contact since placing the restraining order on my dad) now has dementia. Noooo!!!! Tuesday came and went… I spent mornings trying to press into God, then jogging inside my apartment… the rest of those days were spent caring for little guy… today, well… I did my morning quite time and jogged around the apartment and headed off to do laundry and… the pain started up again! With a race I was hoping to run this weekend… Lord knows what will happen. All I know is… despite this pain and my current trials, somehow… I’ll press on! If the Lord wills it for me to race, He’ll provide a way to restore me to health. Meanwhile, I’ll continue to praise Him knowing that whatever comes of all if this will truly be for His glory. I’ll continue to love and obey, and I chose to continue to believe. No matter what the future holds I’ll believe in the radical promises of my most high king knowing that ask things work for the good of those who love Him and are called according to His great purpose! 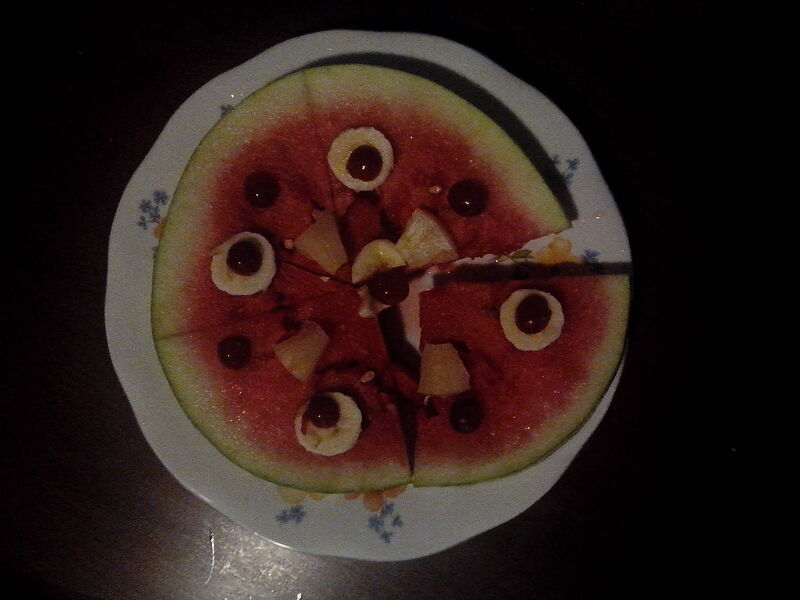 Today, I’ll leave you with a recipe for fruit pizza! I saw an image online that sparked an inspiration, so… I got creative and decided to make one of my own! I hope you also get to try! -Place fruit pieces on to of the watermelon however you see fit, then cut into slices and serve! This is a great treat for a healthy desert or you can serve it at a potluck or gathering.